I was last with you in your Vancouver 2017 Conference, sharing my second book, Inquiry & Action, Designing Impact for the Human Hive. Earlier that year, I was with you in Kitchener/Waterloo exploring Placecaring and Placemaking in your Collective Impact Conference. This letter is to renew and continue an inspiring partnership – and to invite you to join me in Findhorn, Scotland, this April and May 2019 for 2 Integral City courses:Beyond Resilient speaks to the heart of Tamarack aspirations through Placecaring & Placemaking for/with/as the 4 Voices of the City. Beyond Smart provides introductory Practices, Tools & Maps for reinventing the city as a Living System. The links to those programs give all the details for curriculum and registration. What I want to do today is to let you know why Findhorn is the perfect venue for these programs? It is precisely because it is an example of a community that has grown organically since inception to today. Findhorn Foundation has evolved as a living human habitat, since the Founders planted the first seeds 56 years ago. They nurtured seeds to grow a garden from wild and inhospitable sand dunes. They cultivated seeds from learning by doing, so the lessons of mutual trust and respect became three Principles and a Common Ground Guideline to disseminate and share with the rest of the world. They imagined seeds of a community of practice so practitioner-students could learn how to reinvent human habitats and share them with the global home centres of the students. As a result of the Founders’ attention to the Beautiful, the True and the Good, Findhorn Foundation has become famous as a centre for eco-village design, a school for action learning world-work and a sanctuary of fiery hope for universal spiritual practice. Co-creating with the intelligence of Nature. Work is Love in Action. What better place to invite the 4 Voices of the City (Citizens, Civic Managers, Civil Society/Third Sector, Business/Innovators) to step out of their usual surroundings and convene in unusually inspiring life conditions? In our Beyond Resilient and Beyond Smart courses we can observe first-hand the Findhorn experiments that many cities aspire to for sustainable and resilient infrastructure – the Wind Turbines (generating renewable energy); the Living Machine (cleaning waste water); Cullerne Garden (growing food for the Community Centre); the Bio-Generator (providing central heating); the Moray Car Share (sharing transport); the Moray Art Centre (offering artist studios, instruction and world-class travelling exhibits); the Universal Hall (convening conferences, musicians, actors, dancers with appreciative audiences). More importantly we can tap into the dynamic, complex and ever-changing life of the community by observing meetings guided by unique Listener Convenors, or Leaders trying out new governance through Sociocracy principles for decision making. We can receive healing through numerous alternative and allopathic modalities and practitioners. We can dance, sing, pray and eat in community. In short, Findhorn Foundation provides a living model of consciousness and culture in collaboration with behaviours and systems/infrastructures. As Integral City Meshworks endeavours to reinvent cities we bring strong support for the necessity of integrating Consciousness and Culture to enable justice, compassion and deep engagement along with Smart City Technology/Systems and Resilient City Environment/Ecology. Thus, we dare to say we step out BEYOND both Smart and Resilient City approaches, because at the same time we transcend and include them. We recognize that as Living Systems the 4 Voices of the city experience these realities simultaneously. Consciousness and Culture are what make possible the Technology and Ecological Resilience of what we call the “Human Hive”. Those are some of the core enticements that Integral City Meshworks can offer to anyone who joins us in our Beyond Resilient and Beyond Smart courses in Findhorn. We will prototype community engagement, discover the strengths of each of the 4 Voices of the City and reframe our understandings of intractable problems in cities where life is volatile, uncertain, complex and ambiguous (VUCA). We will do this, not in a hotel/conference centre but in a community, who can embrace us with the physical, mental, emotional and spiritual care that such world-work deserves. This power of community is especially important to support the reinvention of cities as Living Systems because we need to be building capacity for change and transformation, not just at the individual level, but at the organizational and community levels simultaneously. Like the founders, members and associates of Tamarack I have been inspired by a passion for the power of community for many years. The high quality combination of practical skills, collegial learning and scholarly resources that Tamarack provides has attracted me from my first encounter with you through Founder Paul Born (who is from Abbotsford, BC, Canada where I lived for 25 years and researched much of what has now become Integral City as a global endeavour to reinvent cities as Living Systems) and later Liz Weaver and Mark Cabaj. 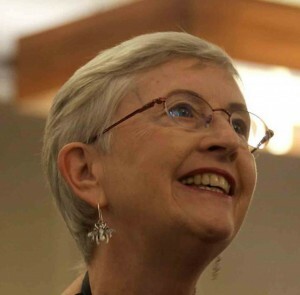 I have been influenced by many of the same activists, experts, authors and catalysts as yourselves – including Margaret Wheatley. She always asks, when creating the conditions for self-organizing change, “Who else should be here?” I ask myself that often – and in writing to you Tamarack – I would love it if you could be here to participate in these 2 courses. Each of us is doing world-work that depends on the other. And so, I invite you to join me and the Integral City Meshworks team to venture out Beyond Resilient (click here for the details) and Beyond Smart (click here for the details). I am really looking forward to meshing our energies in service to Gaia’s evolution and wellbeing. This blog series connects Tamarack & Findhorn Communities. This blog was originally published on Integral City on March 12, 2019. Author of Integral City: Evolutionary Intelligences for the Human Hive, and the Integral City book series, Dr. Marilyn Hamilton is the Founder of Integral City Meshworks Inc. and TDG Holdings Inc. Marilyn leads a practice community using Integral City frameworks and practical tools to support multi-stakeholder groups in transforming their whole city and eco-region into habitats that are as sustainable and resilient for humans as the beehive is for bees. 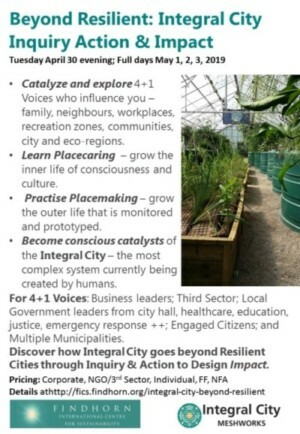 Her Integral City approach incubates transformation strategies for City Staff, Civic Leaders, Civil Society, Business Entrepreneurs and Community Participants that integrate their contributions with Purpose, Place, Priorities, People and Planet.